The Citi ThankYou travel rewards program is very similar to the American Express Membership Rewards and Chase Ultimate Rewards programs. Just like those two, Citi ThankYou allows you to book travel through its own portal or transfer your points to airline partners if you have a premium card. These credit cards allow you to earn Citi ThankYou points. The most important consideration is the type of card that you have. A Citi Prestige cardholder gets 1.33 cents per point, while a Citi ThankYou Premier cardholder gets 1.25 cents. The eight-cent difference might not sound like much, but it adds up for costly tickets. In addition, due to the special relationship Citi has with American, Citi Prestige cardholders can get a terrific value for booking with points at the Citi Travel Center – 1.6 cents per point. Unfortunately, Citi doesn’t extend this benefit to ThankYou Premier cardholders, who get the same 1.25 cents per point for all airlines. Citi has 13 airline partners, but it doesn’t include any major U.S.-based airline partners, and that can be a problem sometimes. 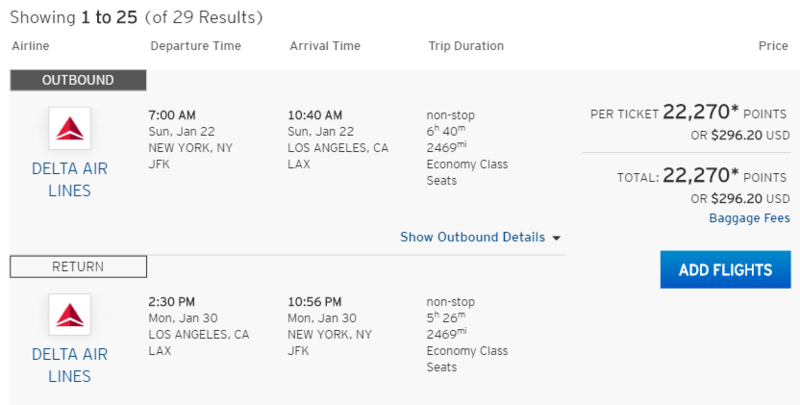 Booking a simple award flight on Delta, , United, or American website is relatively easy. You can search for the desired flight, and if it’s available book it right away. With foreign airlines, it can be a little trickier. First, not all programs allow you to book their partners’ flights online. For example, Cathay Pacific lets you book some American flights online, but Etihad doesn’t. You would have to call and hope to get a knowledgeable agent who can find a partner’s award flight for you. Second, most airlines open more award space to their own members than partner airlines, which means that a flight available on the United website might not be available to someone with Singapore or Thai miles (and vice versa). There is another reason why you might want to book your ticket at the Citi Travel Center. Not only do you get to choose your desired carrier and flight, but you will usually earn airline miles. That’s right. Even though you’re booking with points, you will earn the miles as if you bought a revenue ticket. These considerations may discourage you from transferring ThankYou points to frequent flyer programs when the cost difference is not too great. You might want to choose the ease and convenience of booking your flight at the Citi Travel Center, even if it costs a few more points than transferring your miles to an airline program. Sometimes that is worth it for the convenience factor. Remember that depending on your Citi card and your preferred airline, your Citi points can be valued at 1.25 cents (Premier ThankYou card), 1.33 cents (Prestige card) and 1.6 cents per point (Prestige card on American). In real life, however, you won’t necessarily do better by taking advantage of this fantastic 1.6X American rate. Let’s take a look at the examples below. 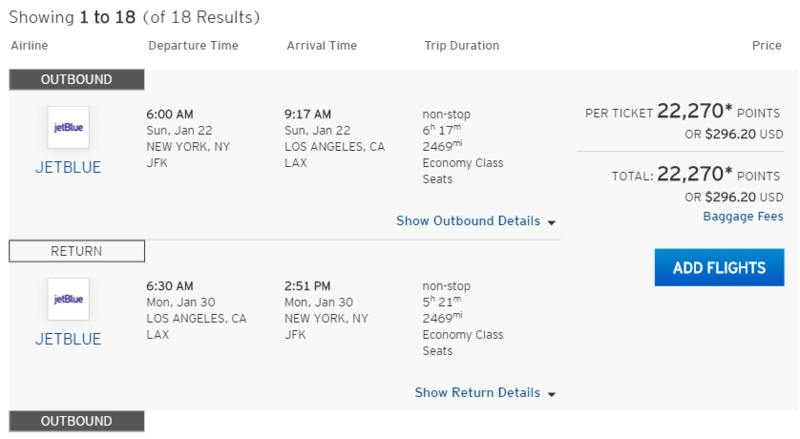 We have found a great rate on American – just 22,262 miles for a transcontinental round-trip flight between New York and Los Angeles. We would be hard pressed to find a better option by transferring points to an airline program. This is a good price to pay for a long round-trip flight, especially as you will likely earn airline miles on this ticket. But then, if we check other airlines, we’ll find the same 22,262-point price tag. Here is the same flight on Delta: 22,270 points. 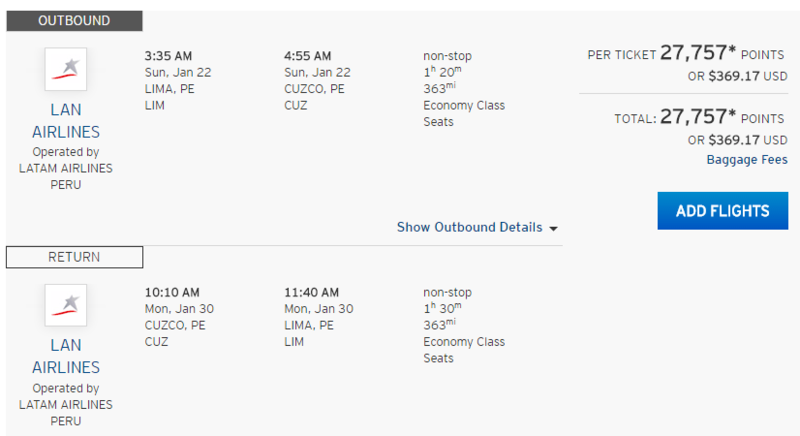 Here is the same flight on JetBlue: also 22,270 points. And here is the same flight on Virgin America: same 22,270 points. It might look strange, since Citi ThankYou points are supposed to be worth more on American, but the reason these flights are priced approximately the same is quite simple – the revenue ticket on American costs $360, while the same ticket on other airlines costs around $290. So make sure to check all your options, even though you’re supposedly getting a better deal on American. In our example, you wouldn’t save points, and you can choose the most convenient flight times, routing or just the airline you’re already collecting miles with. Citi doesn’t generally include foreign low-cost carriers, but with an overabundance of European budget airines even legacy carriers price their flights within reach. 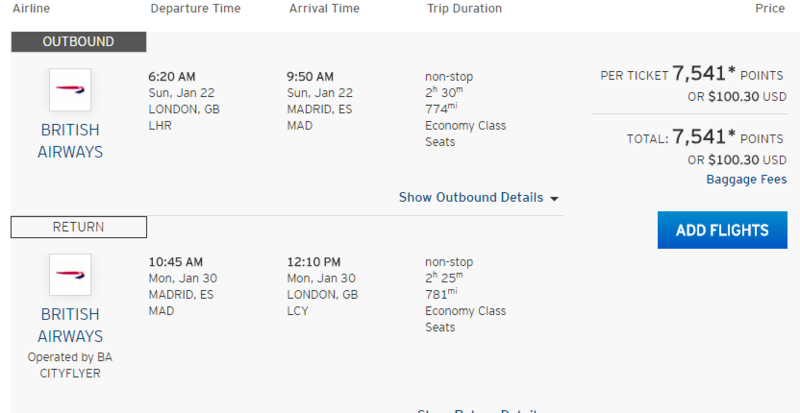 This flight on British Airways is shown for Citi Prestige cardholders (1.33X). If you are a Citi Premier ThankYou cardholder, it will cost you 16,480 points (1.25X). We always encourage you to check the Travel Center prices against other online travel agencies, because Citi isn’t always competitive, especially for flights originating outside of the U.S. 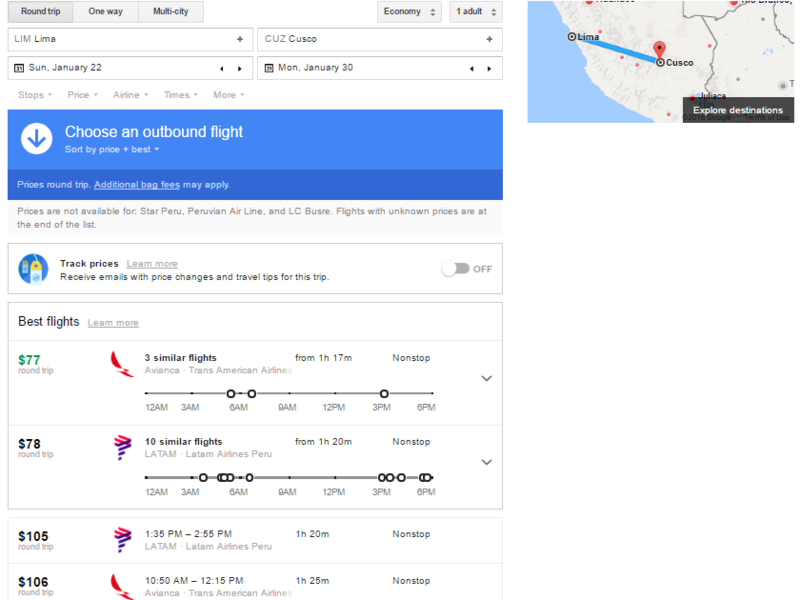 Anyone who has been to Machu Picchu knows how ridiculously expensive a short, 1.5-hour flight between Lima and Cuzco can be. If you check the Citi Travel Center, it will reinforce this notion. But if we check the same dates on Google Flights, we’ll find a completely different picture. When the gap between the Citi Center and other travel booking portals is that big, you might want to either transfer your points to an airline program or save the points and book your ticket for cash elsewhere. 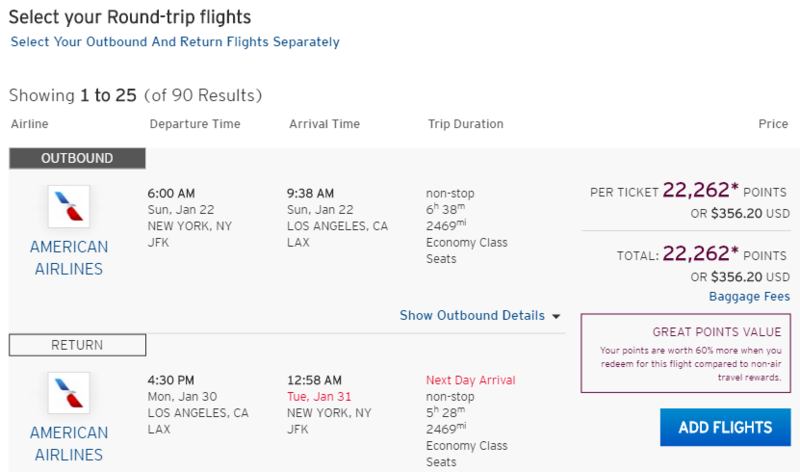 You will rarely find a good point value at the Citi Travel Center for expensive airline tickets, such as ultra-long haul or premium class fares. Unless you manage to find an incredible bargain, you probably should transfer your points to an airline program of your choice if you want to maximize your redemption value.